Most of the time it happens that users who are reviewing suggested edits are just scanning the text and if it looks good, the edit is accepted. This works in majority of cases, but sometimes, some invalid edits gets approval and this changes whole point of the question. What should be done under these circumstances? Should we edit it back to the original content, though it would look strange because that edit was approved by 4-5 other community members? Now in this case, fortunately the OP came back and improved that edit. But WHAT IF the user was completely new? Shouldn't be there any "Review Edit Once Again", or Flag edit for moderator's attention functionality that will bring back the attention of community members or moderators saying that the edit which was approved or rejected should be considered once again? We trust users with 2k+ rep to make and approve good edits. Supposedly. 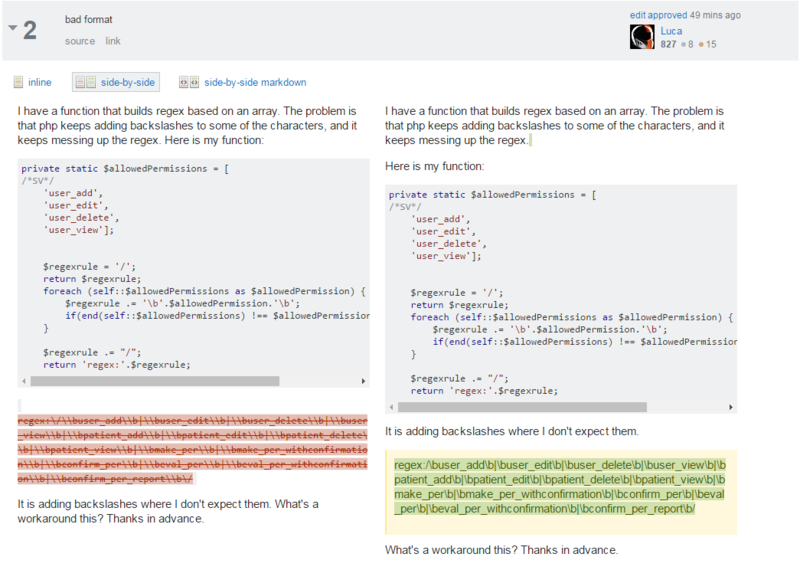 I think suggested edits already need more approve votes than other sites do. We already have this feature. It's right next to the close button on the actual question page. 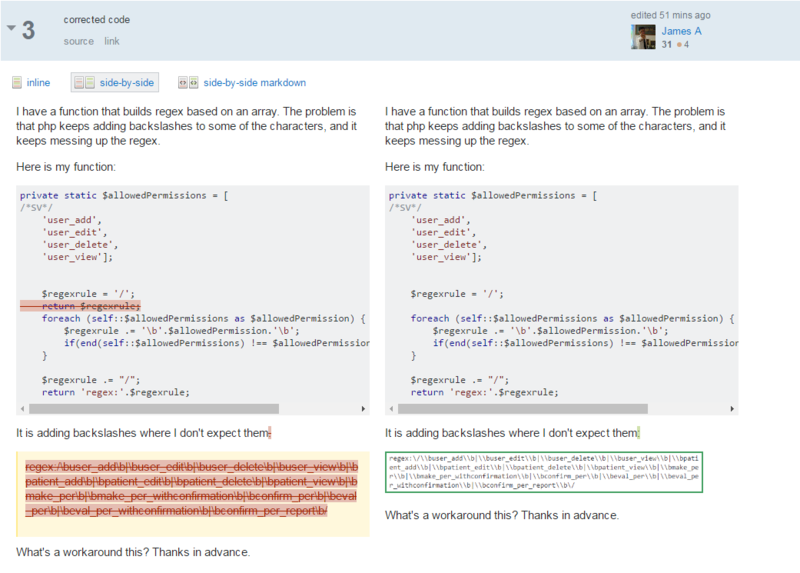 Another SO user edited his question and removed extra backslashes from his content. The user simply changed the way things were rendered. The change in rendering is what broke things. This is a misunderstanding in the way that markdown works. One might hope that users with 2k rep and even one with 4k rep would understand the system better, but you'd be hoping in vain. Even ignoring the fact that the format was broken, there was no reason to approve the edit. The one newline was really the only improvement, since the other part of the edit simply moved the one phrase around. Also, there is no reason to put regexes as quotes. It was the OP's regex, and regexes are code. I have fixed things (including removing the "thanks in advance"). The code should not be a picture, but I don't fault the user, who may not have realized their question was edited. 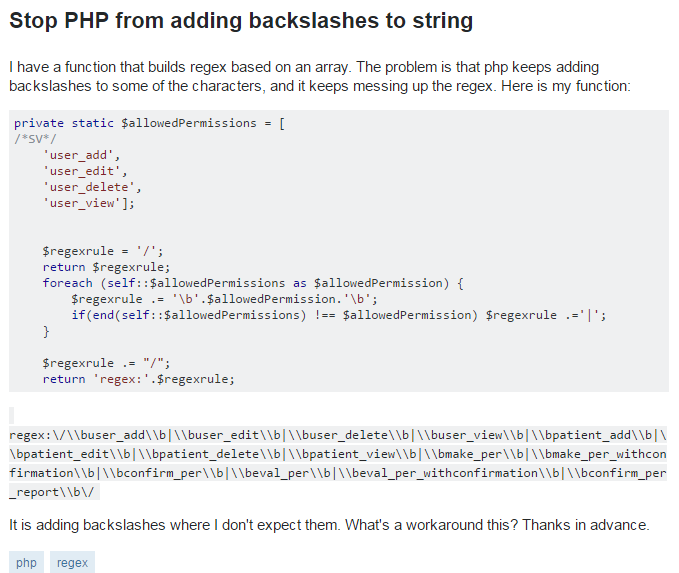 I chose to use back ` ` ticks because you can see the entire regex that way.